One of the main functions of your roof is to keep water out of your home. When moisture is allowed to enter the main structure of a building, it can cause damp, rot and other serious damage which can be extremely expensive and time consuming to repair. Because of this, it is essential that your roof is as well-constructed as possible in order to prevent water from entering your home. Flat roofs are particularly at risk of water damage, as water can easily gather in pools on a flat surface, so if you have a flat roof it is even more important to ensure that every waterproofing precaution is taken. Here we look at some of the essential steps which you need to take to ensure your roof as is as waterproof and hardwearing as possible, to keep your home warm, dry and safe for many years to come. Many of us never think about cleaning our roofs, but if you want your roof to remain in good condition, it is extremely important to keep it relatively free of dirt and debris. 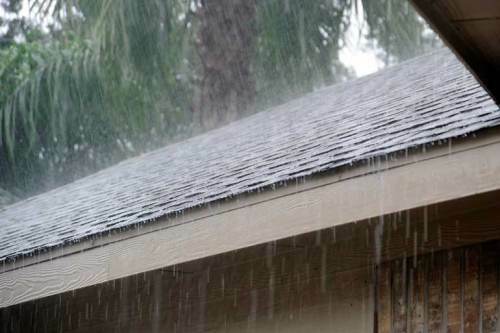 This is because, if debris such as leaves and branches are left lying on your roof, the rain can cause them to form blockages which can then cause water to puddle and damage your roof. In addition to having your roof inspected by a professional, you can also help to prevent this yourself, by making sure any trees growing close to your roof are kept trimmed on a regular basis. This makes sense not just to prevent a build-up of debris on your roof, but also to make sure there is no risk of anything heavy falling onto your roof in a storm, potentially causing serious damage. The shingles on your roof are designed so that water will roll off them, preventing moisture from seeping under the roof. If any of the shingles are damaged or missing, water can enter the building, causing damp and even structural damage in your home. It is important to check regularly to make sure all your shingles are present and in good condition. If they are loose, it could only take a strong wind to detach them. The flashing on your roof is of equal importance. This is the steel or aluminium that fits around your chimney and the vents in your roof to prevent leaks. If the flashing is damaged, this gives moisture an easy way of entering your home. If you spot any problems with your shingles or flashing, it is essential to call a professional roofer to put things right before the problem has a chance to become more serious. Doing this can save you a lot of damage and expense. A professional roofer can install a special waterproof membrane to offer your roof further protection from water damage. These are usually made of highly efficient materials such as PVC or synthetic rubber, and they are bonded together in large sheets, so there are no joins where water could enter your home. Different membranes are suitable for different types of roofs, and it is vital to get this right, otherwise you could be making more problems for yourself. It is essential this job is tackled by an experienced roofing specialist, who will be able to identify the right type of membrane for your particular roof. Probably the best and most popular solution when it comes to making a roof more waterproof is to use a liquid waterproofing system. This is a safe and cost-effective method of adding more protection to your roof, by preparing the surface and then adding two or more layers of the liquid to form a solid coating. Again, this is a highly specialised job which should only ever be undertaken by a professional roofer. If it is done right, it could offer additional protection to your roof for up to 25 years, saving you the hassle and expense of water damage to your home. At Roundhay Roofing, we have extensive experience of providing highly effective roof waterproofing solutions for a wide variety of customers. If you would like to know more about what we can offer, or for a consultation and quote, please contact us.